The diamond industry has been run with inefficient and unproductive processes for decades. While there was a need for change, no one really attempted to make a beginning. It is no secret that, the glittering industry is conservative and known to resist change. Diamonds are rare, they are stunning and wrapped in rich traditions and customs. Humans appreciated the natural creation, long before the James Bond movie ‘Diamonds Are Forever’, hit the silver screen. It takes more than a billion years for a natural diamond to form, it would therefore be fair to say that diamonds can never be replenished. A supply chain dominated by middlemen, the possibility of overstating the grade (4Cs) of a diamond and the problem of synthetics and fakes, being passed off as the real thing have to a large extent, dampened buyer sentiment. This is something that, prevents the industry from reaching its true potential. From the buyer’s point of view, problems like overpricing, price cloaking and receiving synthetic or fake stones, result in a drop in buyer confidence. This can be better understood if you realize that, diamonds are expensive and money involved can be quite high. The industry has for long, had two respected players, GIA (Gemological Institute Of America) and DeBeers. Until very recently, a diamond certification done by GIA meant that, the diamond was natural and was reviewed in an unbiased and accurate way. DeBeers was considered to be, the undisputed reservoir of the best – natural diamonds. Those were the days when neither GIA nor DeBeers, showed any interest in synthetic or fake diamonds. Commercial interest has drastically changed the industry landscape, this unfortunately is not always good for the true diamond lover. And when the marketing hype is unleashed by the likes of GIA and DeBeers, the situation can be worrying. A major challenge currently facing the diamond industry, relates to the proliferation of synthetic diamonds. No matter how romantic sellers might make it sound, a synthetic diamond is a factory made product. Synthetic diamonds are not rare, they will never have lasting value or appreciation mainly because, the technology to make this will gradually spread faster and become more affordable. The day is not far away when, synthetic diamonds will become extremely affordable. This is when the exclusivity and importance being assigned to them, will cease to exist. The industry was shocked when, DeBeers announced that it would be dealing in synthetic diamonds. It went a step further and declared its intentions to actually manufacture these stones. The DeBeers move is fired by pure business interest – not related to the worthiness of the factory made stone. GIA followed suit when it decided to provide certification services for synthetic diamonds. These stones are now being certified with the same, parameters and grading standards as natural diamonds. What GIA and DeBeers have done is to add some imaginary value to synthetic diamonds. They will in the near future, lower their marketing tone for natural diamonds and instead, blast out loud for the synthetic stone. All this driven by the urge to increase their profits. Glitzkoin: It was this scenario that prompted second generation diamond veteran, Navneet Goenka to conceptualize the Glitzkoin diamond blockchain project. A team of diamond experts and technical professionals, meticulously mapped the weaknesses of the multibillion dollar industry, against the powerful capabilities of the latest blockchain technology. Glitzkoin is poised to improve productivity and market scope, for the industry and the glittering stone. The first diamond blockchain to be promoted by an insider from the industry. 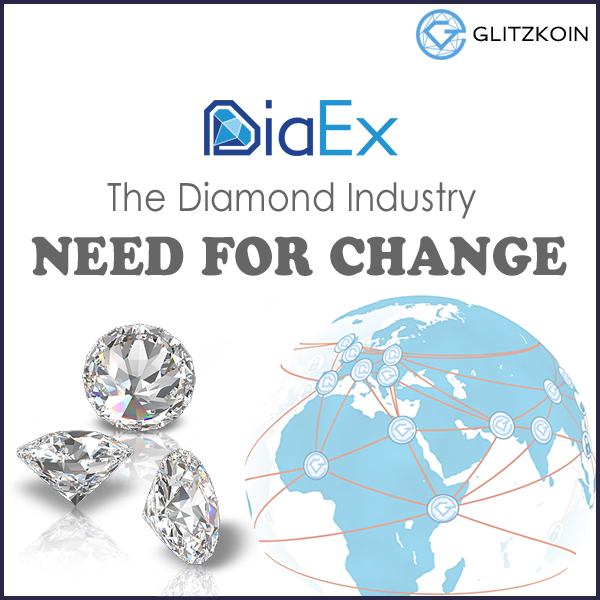 The project includes a diamond trading platform DiaEx that supports both, B2B and B2C trade in diamonds. Traders interact directly with the DiaEx platform, no middlemen and no multiple commissions and profit margins. Listings on the diamond trading platform, are restricted to certified natural diamonds. Both synthetics and fake diamonds, are not allowed to be traded. This goes a long way in boosting the confidence of buyers. Banks have for a long time, imposed cumbersome procedures and high banking fees on payment transfers executed by the industry. The project aims to alleviate these challenges faced by diamond traders. Glitzkoin has designated the GTN crypto launched as part of the project, as the mode of payment on DiaEx. This will allow traders to fulfill their payment obligations without, being dependent on the conventional banking system.